How do I create a Fill-in-Multiple-Blanks quiz question? 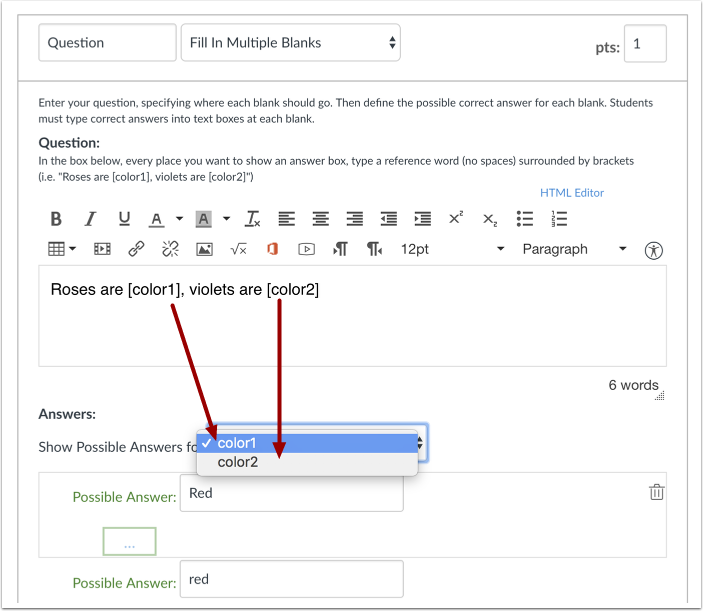 You can create a question that has multiple blanks for students to type in their responses. You can create a sentence with multiple fill-in-the banks, as demonstrated in this lesson, or you can use the same steps to create a list. Click the drop-down menu and select the Fill In Multiple Blanks question type . Type your question into the Rich Content Editor question box. 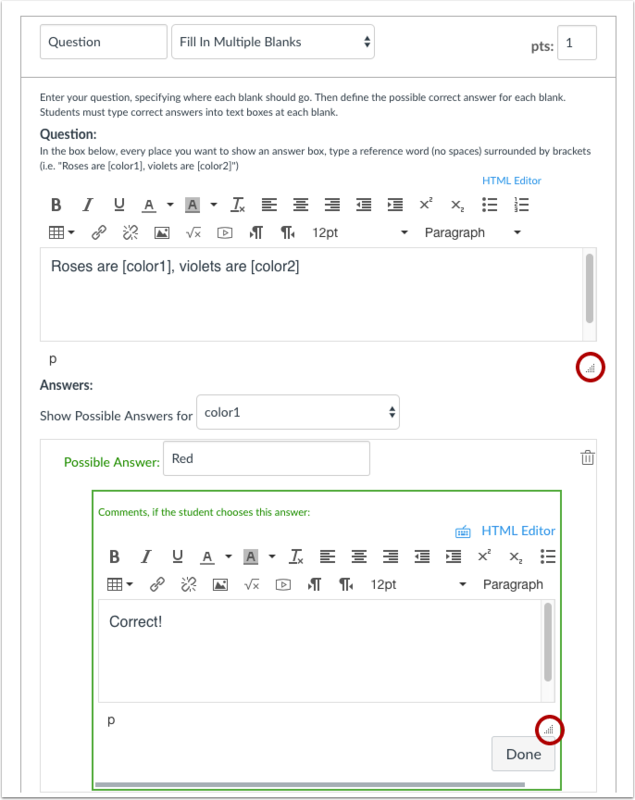 You can also use the Rich Content Editor to include video, images, math equations, or flash activities. 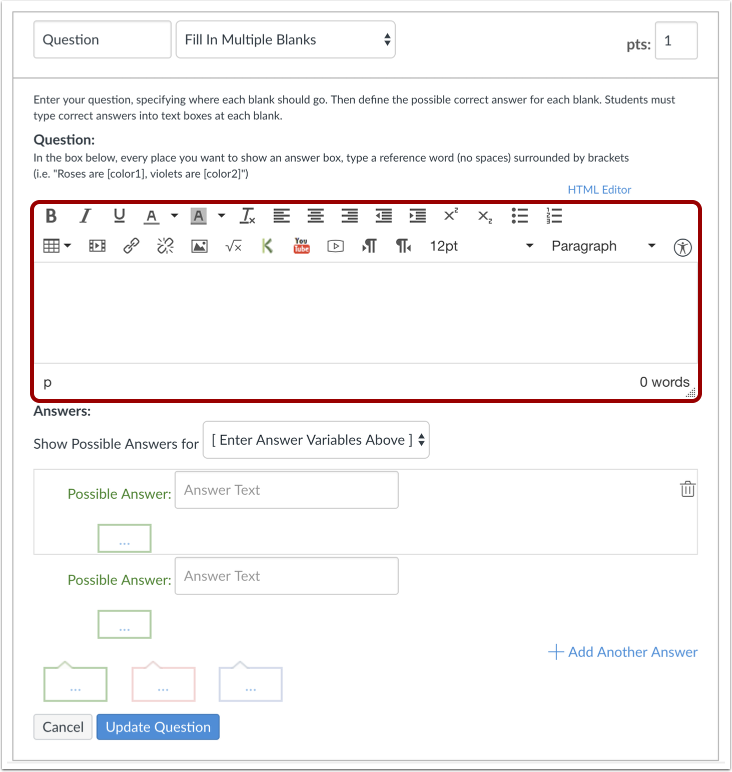 Note: Fill-in-Multiple-Blanks questions that include tables may not display some question content when viewed by students. Now replace the words you want students to enter in the question with reference words. Reference words should be surrounded by brackets and cannot contain spaces, periods, or other non-alphanumeric characters. Once you place a word in brackets, the word will populate in the Show Possible Answers for drop-down menu. For example, red has been replaced with [color1], and blue has been replaced with [color2]. A student will not get full credit for an answer if it is left blank, misspelled, or is incorrect. 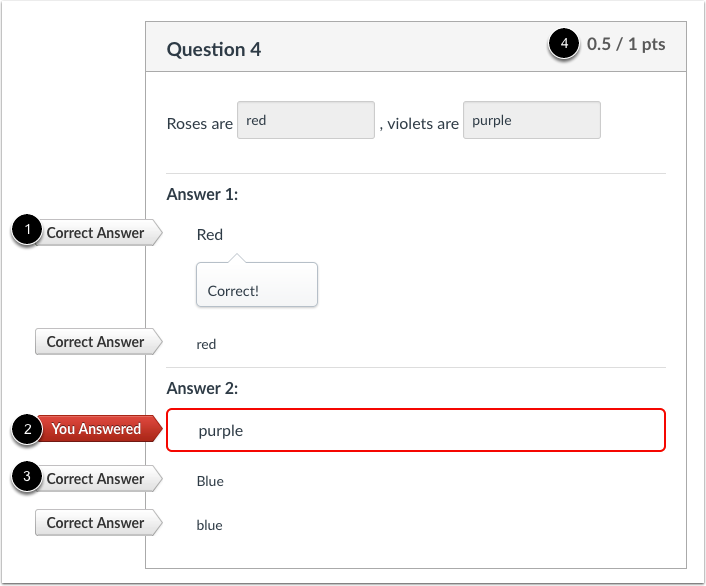 For each item in the dropdown menu, instructors must try to account for all of the possible correct answers that a student might give. 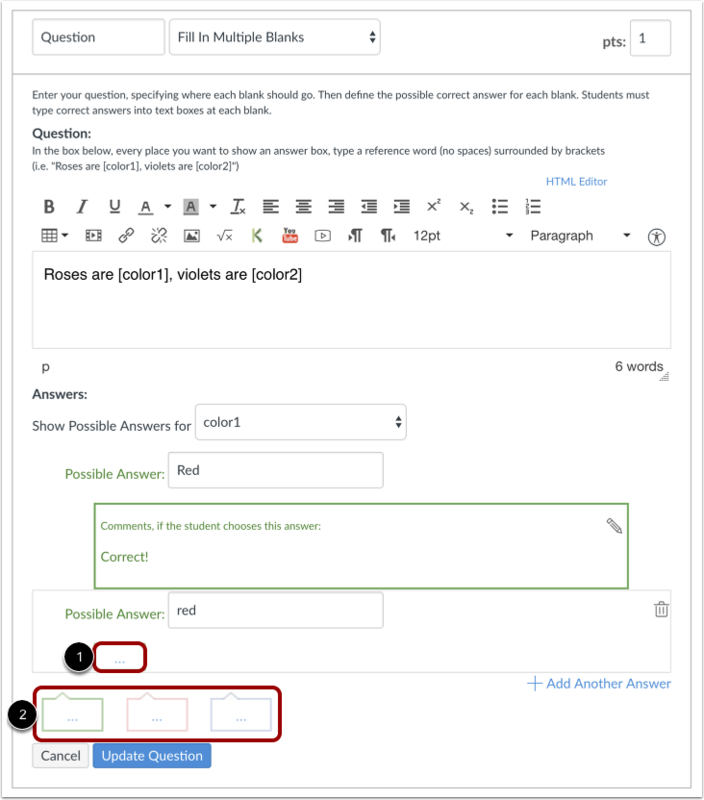 Currently, fill-in-multiple-blanks answers are not case sensitive. Partial credit will be assigned if only one of the fields is filled out correctly. 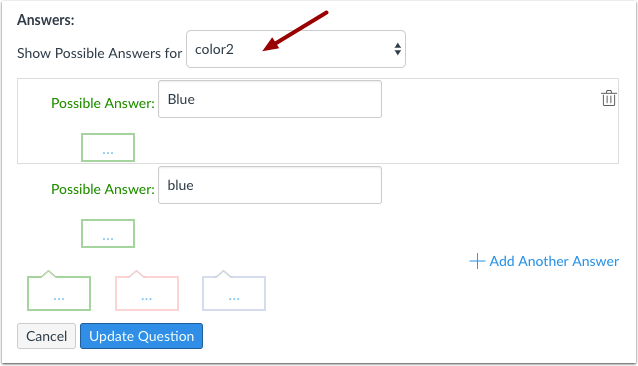 Select the first reference word in the drop-down list and type the different versions of the right answer in the Possible Answer fields . You can add comments for each answer if you wish . 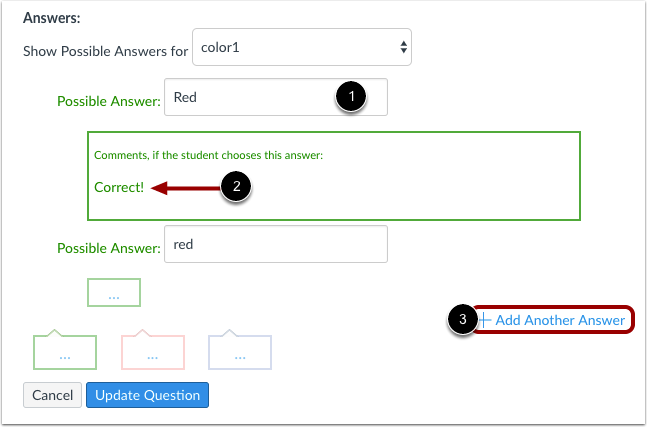 Click Add Another Answer to add more answer fields . Note: If a student does not enter any of the possible answers but still submits a valid response, instructors may need to manually grade the quiz to restore points that they lost. Select the second item in the drop-down menu to create associated answers. Repeat this process for as many reference words as are in your question. This is what students see when they encounter a Fill-in-Multiple-Blanks question. If you allow students to see the correct answers, they will see correct responses marked with a correct answer flag . Their incorrect response will be marked with a red flag  and the correct response marked with a gray flag . Partial credit will be assigned if some of the blanks are completed correctly . Previous Topic:How do I create a Fill-in-the-Blank quiz question? Next Topic:How do I create a Multiple Answers quiz question? Table of Contents > Quizzes > How do I create a Fill-in-Multiple-Blanks quiz question?